Bulbapedia has an article on Aura. Aura is an attack effect in the Super Smash Bros. series that debuted in Super Smash Bros. Melee. Characters hits by an aura attack temporarily emit blue flame-like energy. 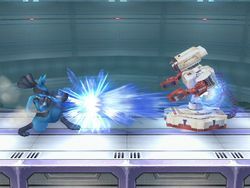 Aura is also a mechanic specific to Lucario that modifies the damage and knockback of Lucario's moves based on its current damage, being weakened when Lucario is at low damage and strengthened when Lucario is at high damage. The aura mechanic only applies to Lucario (even if another character uses an aura attack), and starting in SSB4, applies to all of Lucario's attacks regardless of whether they have the aura effect. When Kirby copies Lucario's Aura Sphere, he does not copy the aura mechanic; his Aura Sphere remains fixed at the power it would have if Lucario were at base aura strength (75% damage in Brawl, 70% damage in SSB4, and 65% in Ultimate). Aura attacks are boosted by Aura Attack stickers in Super Smash Bros. Brawl's The Subspace Emissary and the Support Spirit skill Aura Attack ↑ as well as certain Spirit Battle conditions in Super Smash Bros. Ultimate. Aura attacks are resisted by the Support Spirit skill Aura Resist ↑ in Super Smash Bros. Ultimate. A graph of how much damage aura attacks do based on the user's current damage. Click for full-size version. where r is the percentage of the damage dealt (for example, if r is 80, the attack is at 0.8x strength) and d is Lucario's current damage. Effectively, Lucario's attacks deal normal damage when it is at 75%, weakening to as low as 0.7x damage when it is at 20% or lower, and strengthening to as high as 1.4x damage when it is at 170% or higher. It is known from the official Brawl website that aura is not only affected by damage percentage, but also by Lucario's placing in the match, making it stronger when it's behind (less stocks/points) and weaker when it's ahead (more stocks/points.) However, these numbers are not currently compiled. In SSB4, the effect of aura has been increased overall—the limits are more extreme, as are the multipliers at those extremes. All of Lucario's attacks are now affected, regardless of whether they have an aura effect or not. Effectively, Lucario's attacks deal normal damage when it is at 70%, weakening to as low as 0.66x damage when it is at 0%, and strengthening to as high as 1.7x damage when it is at 190% or higher. Overall, this amounts to a buff compared to Brawl, except when Lucario is at a minuscule 8% damage or lower. In addition to the above, the multiplier is multiplied again with a complicated factor based on Lucario's placing in the match and how many players there are (excluding CPUs). When Lucario's position changes, it takes 6.25 seconds for the new value to scale into full effect; if Lucario's position changes again during this time, the multiplier immediately skips to its new value. The mechanic is named Stock Aura by players. The extra multiplier s that Lucario receives from Stock Aura is determined by the following formula. p is the number of players in the game, excluding CPUs, with a maximum of 4. It does not count eliminated players or take team affiliation into account. t is the number of stocks Lucario is trailing the leader of the match by, with a maximum of 2.
l is the number of stocks Lucario is leading the trailer of the match by, with a maximum of 2. This formula has an additional wrinkle in modes other than stock. In time mode, Lucario's lead/trail is equal to 1 until the difference between it and the leader/trailer is 5, at which point the lead/trail is 2. In coin mode, the value is 0 when Lucario is even and 2 otherwise. Once all these factors are combined, the final aura multiplier cannot be lower than 0.6x or higher than 1.8x. Mega Lucario's aura attacks always deal 1.8x damage regardless of its current damage percentage. Lucario now reaches base power at 65%, down from 70%. Ignoring placing / stock differences, the maximum multiplier of his aura is now 1.6×, down from 1.7×. It is reached at 190%. The values of the "Stock Aura" effect have been revised. In a 1v1 match, when Lucario is one stock behind he receives an Aura multiplier of 1.2, but the Aura caps at around 170% damage. If he is two or more stocks behind, the multiplier value is 1.4, capping around 120% damage. If he is one stock ahead, the multiplier value is 0.9, except below 12.5% damage, where Aura keeps the 12.5% value. During the match Aura effectively only starts to rise after 12.5% damage. If he is several stocks ahead, the multiplier value is 0.8 and aura starts to rise at around 25% damage. These values are still different when there are more fighters. In a 2v2 match, when Lucario is one or several stocks behind he always receives an Aura multiplier of 1.4, capping at 120% damage. If he is one stock ahead, the multiplier value is 0.8. If he is several stocks ahead, the multiplier value is 0.66. In Brawl, it is a common misconception that aura attacks reach maximum power at 182% damage, not the actual 170% damage. This is due to Event 25: The Aura Is With Me placing Lucario at 182% to start the match, implying that 182% is the maximum. A less common misconception is that each of Lucario's attacks has an individual aura cap. This is due to the game not displaying or otherwise acknowledging the presence of decimal figures, so for example an attack dealing a maximum of 9.8 damage can be believed to have capped earlier than one dealing a maximum of 9.0 damage. When Lucario has a high defense stat, the aura grows more slowly. For each point in defense, Lucario needs to receive 1% more damage to reach maximum aura. The Ultimate tip about Lucario's Aura is somewhat misleading. It says its Aura becomes 2.5× when at maximum. This refers to the ratio between max Aura and min Aura (without stock differences), which is in fact around 2.45. This page was last edited on April 23, 2019, at 04:11.